It’s amazing how far a little compassion can go. That was my overall feeling about An Invisible Thread. Laura Schroff, a busy executive, could have just continued to ignore Maurice on the street, but she didn’t. She took notice and did what she could, which was a lot at times, to assist him. I admire how she was moved to help this child, even allowing him into her home, washing his clothes and feeding him. She took a personal interest in him, and for that she should be commended. Laura Schroff suffered through dark periods in her own childhood and I appreciated reading her backstory because it gave me a bit of insight into how her own experiences shaped her in adulthood. An Invisible Thread was a deeply moving story of how just one woman could change the course of someone’s damaged life, and I truly enjoyed it and recommend it. 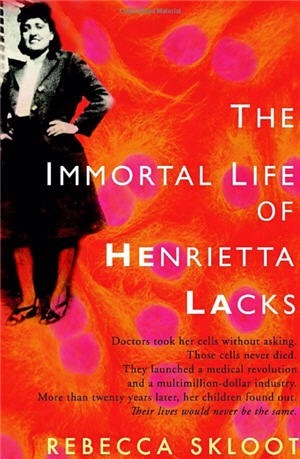 ⭐️⭐️⭐️⭐️⭐️ The Immortal Life of Henrietta Lacks is easily one of the best nonfiction books I’ve ever read (or listened to, as this was an audiobook). Deeply moving, I experienced so many emotions while listening to this book: shock, outrage, sympathy, anger, frustration, fear, astonishment, enlightenment and wonder. I was astounded when I read about how the cancerous cells of a young, poor, black woman were used after her death, and without her consent, to develop vaccines and other equally valuable medical and scientific breakthroughs to benefit countless people, while her own family languished in abject poverty. Henrietta’s cells are still alive today and continue to be used although she died in 1951. They have been multiplied to a number that if measured, according to one assertion, would wrap around the earth three times!! That’s a whole lot of cells considering the fact that about 5,000 could fit on the tip of a pin. Although most of us have probably benefited in one way or other from Henrietta’s cells in the form of medicines, vaccines, etc., the problem is her family didn’t get anything, and could not even afford medical care. Most of them didn’t have medical insurance. This is unjust and disconcerting considering the family never truly consented to having Henrietta’s cells used for medical research, her name (or by extention, theirs) revealed, and her privileged medical information exposed to the world. This was clearly an invasion of privacy in the severist form and my heart went out to the family. I learned so much while listenting to this book; terms such as bioethics, civil liberties, and informed consent were spoken of. I found myself thinking about how important it is to take a closer look at documents that are presented for signature before having medical procedures performed in doctors’ offices, hospitals, etc. I also pondered how some medical professionals and others related to the field can take advantage of the minimally educated, unsuspecting and underprivileged individuals to advance their own objectives; exploiting those who lack knowledge of complex medical terminology and biological science without regard for the humiliation, pain and suffering they may cause to fellow human beings in the process. I came away from the book feeling sad, as though the story was somehow incomplete in some way. I wanted more justice for the family-for them to have been compensated for the way they were dealt with. I salute Rebecca Skloot for taking on such a monumental task as writing this book, which I read took roughly 10 years of research before its completion. I felt it was masterfully written and I recommend it to anyone breathing. ⭐️⭐️⭐️💫 3.5 stars. I truly enjoyed the first 3/4 of this book; it was the last 1/4 that went a little south for me. Krista Bremer shares her life with us, exposing what it’s like to be an American woman married to an older Libyan-born Muslim man. It began as a memoir in which she gives us a glimpse of who she is and what she stands for, and then we gradually become familiar with her husband Ismail. I have to give Bremer credit for the candid way she reveals some very personal aspects of her life with Ismail. She’s also very descriptive in the way she enlightens us about her own religious beliefs, which I have to admit I found a little disturbing. Her irreverent and flippant descriptions of God made me cringe at times. She appears very gullible and quick to adopt whatever traditional views pervade our society without having any real foundation of her own. This perceived personality trait helped me to understand (possibly) her initial attraction and subsequent marriage to her husband. He may have represented something unfamiliar and mystical. However, as we read on we can see how this fascination leads to revelations that are at times very difficult for her to relate to and comprehend. She takes us through her visit to Libya and the appalling conditions that shocked and saddened her. We also see the conflicts and struggles between her and Ismail because of cultural differences; but not enough so. This is where the book began to lessen in strength to me. I started to feel as though we weren’t getting the full story of their lives together. This was a memoir after all, but it got a little disjointed and I felt as though there were parts of their lives that were excluded. When I read Not Without My Daughter by Betty Mahmoody, a true story of an American Woman who married a Muslim man who held her and their young daughter captive in Iran, I got to know all of the characters so fully that when it was over they stayed with me for a very long time. When I finished reading My Accidental Jihad It felt wanting, like I didn’t get the full accounting of their lives together. I really didn’t get to know enough about Ismail and their family in general. Nevertheless, the writing started out very strong and it held my interest nearly to the end. I applaud the author for revealing what we were privileged to learn about her family. I liked it and feel confident recommending it to others. I received an Advance Reading Copy of this book from LibraryThing in exchange for a fair and honest review, which I have given. Thank you LibraryThing and Algonquin Books.